By special request, another shot of the Lotus 23B (! ), this time in mixed company. Is that Ian Stronach in the Kincraft? I believe it is; iirc it was a sort-of Pre F5000 car with a Ford 4.7 engine (but I'm usually wrong ). I posted a photo of it at Aintree on another thread. Thanks Tim, saved me scouring the threads! Chris Meek and unknown (by me, as usual) Capri. A complete Capri guess, how about Vic Mills??? 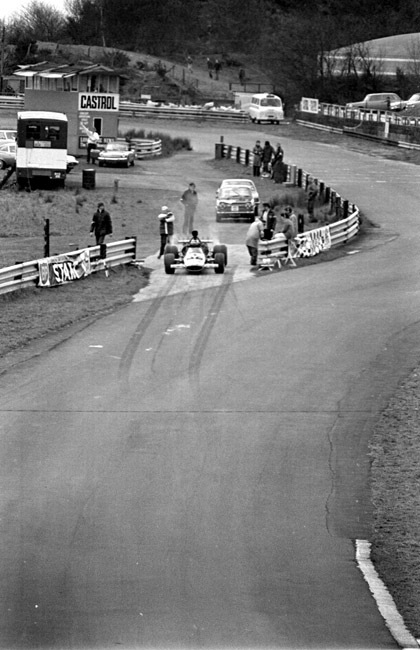 Wasn't the first ever 'proper' FF2000 race held at Oulton? Agree with Dan, it was Mallory, remember being very wet that day too. IIRC Derek Lawrence won it, a mustard yellow coloured Dulon or was it a Crossle? Not many called it FF2000 at the time, it was known as Super Ford. 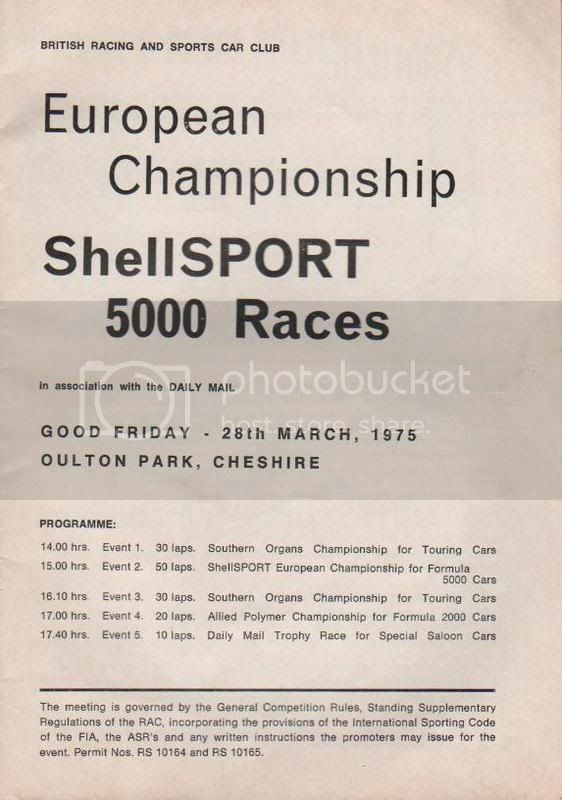 1975 and in March the "Allied Polymer Ford 2000" championship got under way at Mallory Park on the 9th. 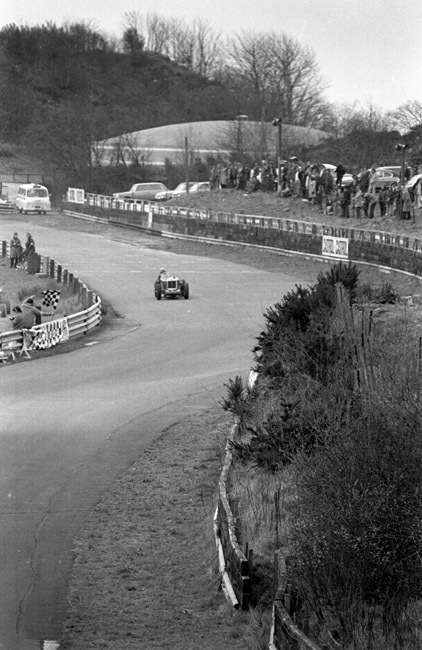 Just a week later on the 16th the second round took place at Brands Hatch whilst on the 28th the championship arrived at Oulton Park. Syd Fox - Hawke DL14; Derek Lawrence - Crossle 31F; Donald McLeod - Van Diemen RF75; Damien Magee - Palliser P742; Ian Taylor - Dulon MP16; Roger Orgee - Royale RP22; Bernard Vermilio - Merlyn Mk 28; Frank Bradley - Elden; Phil Clacher - Alpine; Adrian Reynard - Reynard 75SF; and David Cole - MRE. 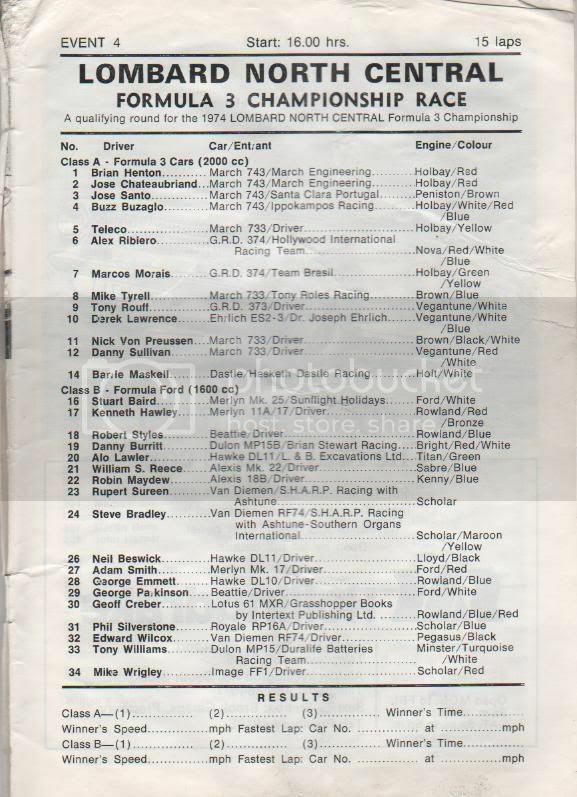 The first points-scoring Super Ford race was at Mallory, but there was a trial event at Oulton in September 1974: it was run as a separate class within an F3 race and I have a feeling only four cars turned up. Vermilio failed to show, Taylor won, Pryor finished second and Morgan set fastest lap. The F3 "section" was won by Henton's works March. That's the one I was half remembering Simon. Thanks for giving me a little belief back in my memory. Although fairly recent, another first for Oulton was the first ever Formula Palmer Audi race in 1998. I recall watching from the hill down towards Cascades. I remember Bjorn Wirdheim being in the field in a multi coloured car, but not much else. Who would have thought it would have lasted this long...and...the concept being developed and renamed as F2! Syd Fox - Hawke DL14; Did that eventually become TON (The Old Nail) and was still winning several years later. Derek Lawrence - Crossle 31F - Isn't that a bit early for a 31F? MRE - Which became Tiga? whilst on the 28th the championship arrived at Oulton Park. That's not this one then, 10th August 1974? Did the F3s come back again in September? They returned on September 28. I speak reasonably fluent Rainford. Probably too much Fosters led to the confusion! It was also the meeting that was filmed by the BBC for 'Go with Noakes', following the LEC Mike Earle / Purley F5000 team around. I still have it on video. Obvious really: it is a Lotus 23B, no wonder it was so nippy. You are joking, I take it Can you point me at any bits that reflect that theory? Alan, and sorry for going off-Longridge topic, Diz was correct re the Crossles, MRE did evolve into Tiga, and the TON was based on the Palliser, not the Hawke. In fact, it may have been built around the Palliser Mad Dog Magee was entered in in that prog pictured. I could just imagine the Top Gear lot let loose at Longridge! It would be mayhem!!!!! Can anyone remember if there was any outcry when Longridge closed ....I seem to recall it just fading away? One Aintree meeting attracted precious few Modsports entries, so somebody had the bright idea of combining them with another class that was short on numbers... I suspect most of the Pre '57 Saloons were lapped at least twice. I remember it at Lydden in '69, again with Jim Moore driving. Dark red, maroon at the time. It had several different paint jobs as it was pranged and consequently rebuilt so often. I did a much better one though. One Special Saloon grid was full to overflowing, so I extracted the upto 1000cc class and put them in with a relatively poorly supported Vintage entry. Big Bentley things and plastic' Minis'. I spent the time from deciding to do this until the chequered flag finally fell absolutely bricking it. I had visions of a special saloon squashed against the barrier by many tons of Bentley. I'm sure a better job would have been done than any car crusher could have managed. In he event of a coming-together between a Special Saloon Mini and a Vintage Bentley I suspect the Bentley driver wouldn't feel a thing. Mind you he would be hard pressed to catch one! Image re-loaded, the link was in place but there was no image. Edited by elansprint72, 17 November 2009 - 08:42. This shot shows the sprint start-line in the "pit-lane"
Edited by elansprint72, 17 November 2009 - 08:40. Is that an ambulance to the left in the first shot, or a dormobile-shaped portent? Rainford half-asleep alert... Jim Ravenscroft is known to his friends as John. Was Peter Kirkby the same bloke who sponsored Alo Lawler through LEP? I believe he is one and the same. The T142 often used to be parked in front of his house on Park Road, Hale. The car accelerating out of the "pit-lane" is that of Simon Riley (McLaren-Rover M10A/B) who came second in the run-off. Do you by any chance have the results of the run-off? In particular the list of runners and their times? Certainly looks like an ambulance! 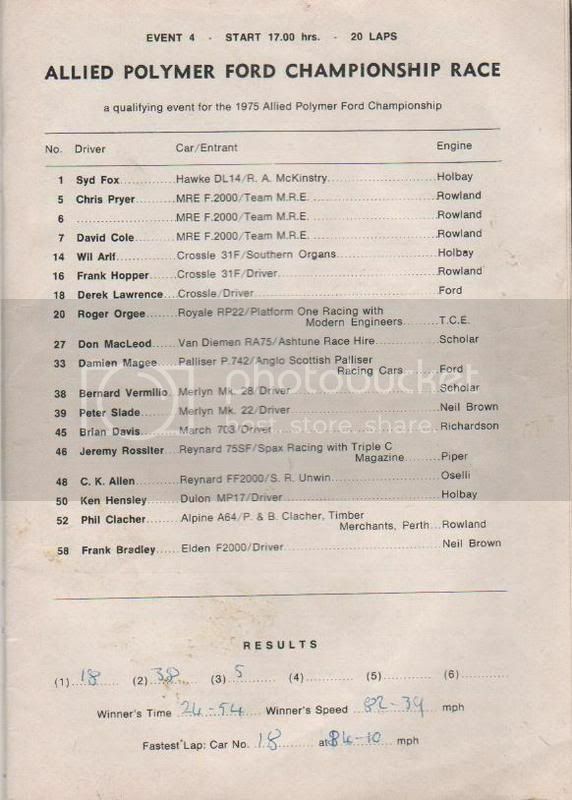 20th March 1977 - Dave Harris in the McRae won from David Render Lotus 76. Keep them coming guys, good to see the sort of stuff that used to run there.